Leonard Jirak, who recently retired as a fisheries biologist with the Kansas Department of Wildlife, Parks and Tourism, prepares to empty a net of walleye fingerlings during Saturday’s walleye harvest at Melvern Lake. MELVERN LAKE—Even though he recently retired, folks who know biologist Leonard Jirak know they won’t find him sitting in a rocking chair on the front porch anytime soon. 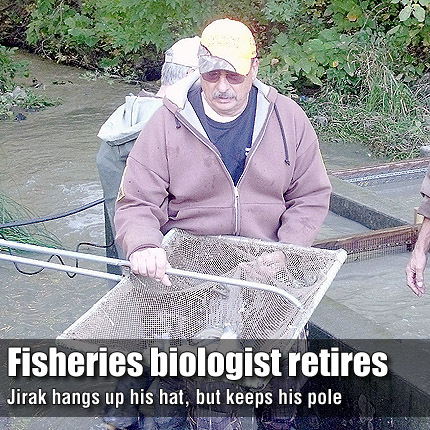 Jirak, of Hartford, has retired at the age of 61 from his job as the Kansas Department of Wildlife, Parks and Tourism’s fisheries biologist for the New Strawn district. Although Jirak officially retired in mid-September, he returned Saturday for one last walleye harvest at Melvern Lake. For years, he has been involved in the Melvern Lake walleye harvest that takes place every fall. Jim Franz, natural resource manager from the Melvern Project Office, praised Jirak for his accomplishments and hard work. “Leonard has had a tremendous impact on the fisheries program at Melvern Lake since his efforts to help begin a partnership program in 1990 between the KDWPT, the Corps of Engineers and the Kansas Walleye Association,” he said. “Leonard worked diligently to develop a unique fishing opportunity for visitors to Melvern Lake. They created a stocked fish pond in the 90-acre lake in the Outlet Park located below the dam. Jirak’s fellow biologists also praised his work ethic, and what they refer to as an “indescribable knowledge” about eastern Kansas’ waterways. They also tell stories of how much Jirak has enjoyed his job and being on the water and experimenting with different ways of improving his fisheries.